The Ethiopian Airlines flight that plunged from the skies on 10 March 2019 killing all 157 on board eerily mirrored the 29 October 2018 Lion Air Java Sea crash. And it set alarm bells ringing around the world with major repercussions for the aircraft manufacturer. Confronted by a second fatal incident involving a B737 MAX 8 and riled at Boeing's suggestion that poor maintenance or pilot error may have played a crucial role, Lion Air moved to reconsider its US$22bn 200-aircraft order. Garuda, the Indonesian national carrier may follow suit. Has technological wizardry got in the way of human skill and judgement? The MAX-8 is an impressive plane but, as with its predecessors on the 737 line, it had niggles. Sporting larger repositioned engines (altering the weight balance) and a naturally high angle of attack, low-power performance stuttered with a tendency to stall at slower speeds. Boeing's fix was to install an all new MCAS (Manoeuvring Characteristics Augmentation System) designed to bring an aircraft's nose down to increase speed and augment lift in low-speed situations. During the flaps-out take-off phase as the ill-fated planes banked sharply before gaining speed the MCAS would have been triggered. The MCAS is a major new addition to the 737. Incredibly, it was not highlighted to pilots who, even after the Lion Air incident, were unaware of this feature or why it had been introduced despite a belated bulletin from Boeing. What has emerged over the years is a pattern of obfuscation by Boeing; its consistent deflection of media discussion to pilot incompetence or poor maintenance; intense political lobbying by the aircraft manufacturer (a major player in US military contracts); and a dangerously cosy relationship with the FAA. 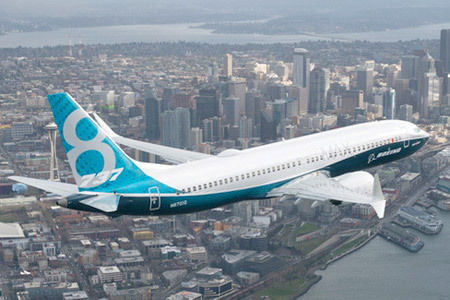 The MAX-8 basic fuselage has not changed from the first 737s though the cigar tube has grown longer to accommodate 210 passengers at 39.52m in length. The MAX-10 will accommodate 230. The original aircraft seated 85. The larger General Electric engines on the MAX-8 necessitated a repositioning of the mounts and an elevation of the nose wheel to provide the engine housing sufficient clearance on a low-slung plane. A toxic combination of design flaws and sloppy certification raises questions for not just the MAX-8 but other multi-generation aircraft that have outgrown their original design parameters.